This Pikachu cake was made for my son’s 8th birthday. I first baked 2 cakes in bowls for the rounded parts then 4 more flat rounds for the height. The hands and feet are made from Twinkies that were cut in half. I used red fruit roll ups for the cheeks and mouth then drew on the rest of the face. Pikachu’s stripes are made from chocolate powder that I put on with a paintbrush lightly dabbing it on. I created the tail by cutting Twinkies into angles and securing then with skewers that I had cut to size for a little more stability in the cake. I put in skewers and also in between the layers put melted chocolate that when it cooled left a chocolate plate like in between. The ears are made from frosted ice cream cones that I also dusted with the chocolate powder. The poke ball that I put off to the side as a second cake was made from baking 2 small caked in bowls and the black line going around it was done with black licorice. The black circle was made with a very dark purple fruit roll up that I cut into shape for the topper. On the pokeball I just got in my kids toys and took one of their Pokemon guys! 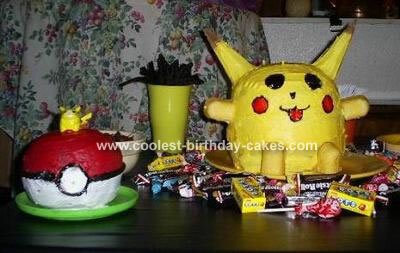 I LOVE the Pikachu Cake! I am going to give it a shot tomorrow… Thank you so much for the tips – I’ll post a pic, whether I succeed or flop! Thanks again! I completed the cake but made it too big and heavy. It collapsed but when I put separator plates in and covered them it worked but didn’t have the round bottom as that was what failed. The little 8 year old loved it except didn’t like the tongue out so removed it and was successful!! I used fondant for the tail and put it up the back and black buttercream for the eyes.